Did you catch the show about the Elvis Idle? (If you missed it, you can hear it right here.) We opened that one by sharing some of our favorite badly translated signs from around the world. We had assumed they were all posted by non-native English speakers, until a listener wrote in to set us straight. I was particularly amused by the opening segment of your show last week. You read signs & notices written by people for whom, you said, English was not their first language, and thus they conveyed unintended messages. One sign read; "If this sign is underwater, the road is impassable." You said it was from Athy, but you didn't know where that was. Well I do. And I know the guy who put up the sign (although I can't reveal his name for legal and social reasons). Athy (pronouced "Ah-Thigh") is, surprise-surprise, in County Kildare, IRELAND! I grew up 10 miles from there. The Irish possess a logic that can only be understood from the inside. As Niels Bohr might have put it: "Those who are shocked when they first come across Irish Logic, cannot possibly have understood it." 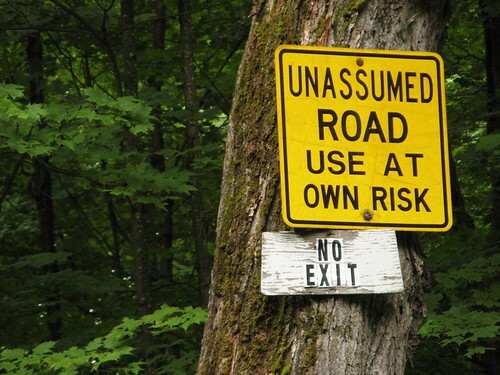 So, not only does that road sign makes perfect sense to the guy who put it in, sadly, it also makes sense to me! It reminds me of the story about the guy who went into a bar in Dublin and asked for a coffee without cream. The barman said: "I'm sorry, but we don't serve cream, I'll have to give you a coffee without milk."